This book addresses the global need for more comparative studies on health policy and health care systems, given the rise in recent decades of societal aging, modern mass diseases, economic globalization, and resulting permanent fiscal austerity of governments which have fundamentally altered the status quo of health care systems. 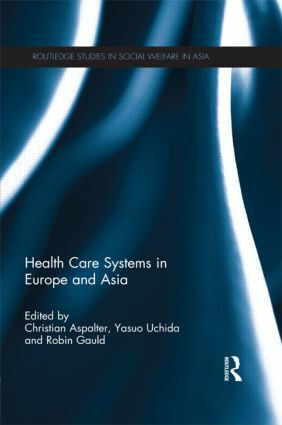 The book examines the healthcare experiences of the most developed countries in Asia (Japan, South Korea, Taiwan and Singapore) and compares these with four of the most important health care systems in Europe (UK, France, Germany and Italy). Focusing on the public health care systems the contributors discuss the rising need for reforms in health care and health insurance administration, delivery systems, financing and overall health care policy strategies, particularly in fast-aging societies in Asia, and highly aged societies in Europe. This book will appeal to students and scholars of health care policy, health and social administration, social policy, public policy and social work. It will also provide a reference for professionals who need a view of the trajectory of public health financing in relation to changed and changing demographics and disease patterns. Christian Aspalter is Professor of Social Policy and Former Founding Head of Social Work and Social Administration Programme, Beijing Normal University-Hong Kong Baptist University United International College, Zhuhai, China. Yasuo Uchida is Professor Emeritus of Kobe University, Japan, being cur-rently Professor of Policy Science, Doshisha University, Kyoto. Robin Gauld is Associate Professorof Preventive and Social Medicine, Dunedin School of Medicine, University of Otago, New Zealand. This series focuses on social welfare problems and solutions, practices and theories in all of Asia, relying on a strong and wide network of academic organizations and experts in social work and social policy. Including books on health care, old-age security, family and child welfare, gender and social welfare, social policy in general, social work in general, as well as more specialized topics like international disaster relief and long-term care services.